Join the discussion on our forums! Come discuss Muckmorpher over in our dedicated Muckmorpher discussion topic. Battlecry: Transform into a 4/4 copy of a different minion in your deck. Fan favorite in the muck morphin' sewer strangers. Easily one of my favorite cards from the set. Such a fun deck to play around with! 5-mana, become Big Bad Archmage, summon a random 6-drop. 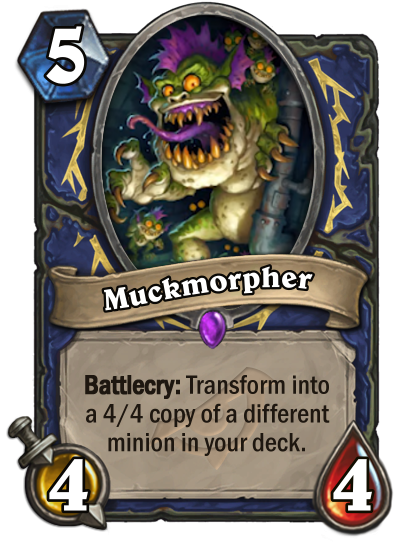 Malygos is an obvious first pick, but Muckmorphers can be anything you want them to be. Alright everybody, I'm starting a theory crafting thread! Post something you plan on making and playing for Rise of Shadows! This doesn't really need big minions to work. Malygos and all the OTK plans aside, just haivng a deck with huge, non-battlecry effects is plenty enough. On the high cost end we got Lich King, Rag, Sylvanas, Cairne, Sneed, Halazeal, White Eyes and more, while on the lower we can go anywhere from Arfus to Piloted Shredder, Argent Horserider, Flametongue, Devilsaur Egg, Thalnos, Mana Tide and even the dreader Annoy-O-Tron and more. Doubling, tripling and quadrupling on some massive effects can allow for this to be a really huge value card. 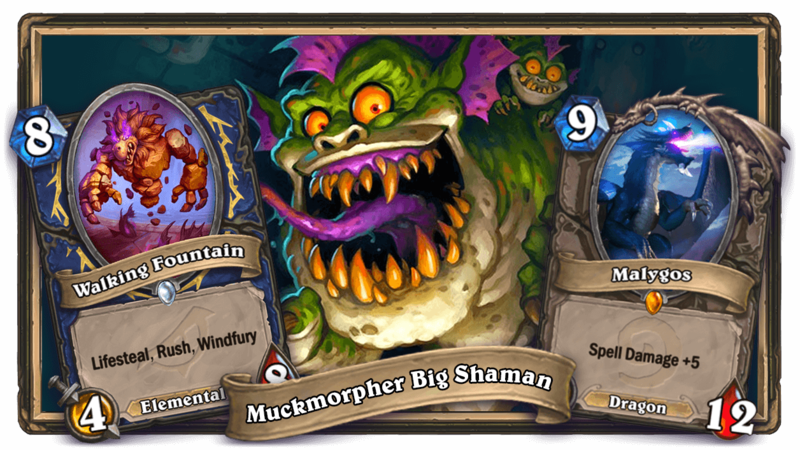 This could have some usage along the murlocs shown for Shaman. Another copy of say, the legendary murloc would be amazing, and there's several of the other ones that wouldn't be bad having around as a 4/4. The one refilling your hand too for example.